With the NHL playoffs under way Wednesday, we take a look at who’ll sink or swim in the Atlantic Division. Tampa Bay, Boston and Toronto once again locked up the top three spots, making this the poster child for changing the divisional playoff format, as we’re guaranteed to see two of the top five regular season teams in the league eliminated after just two rounds. I’m sure the NHL will respond decisively…Columbus took a huge gamble, adding in a big way at the trade deadline, while retaining pending UFA’s Sergei Bobrovsky & Artemi Panarin and the one bag they already have packed. The Blue Jackets snuck into the final Wild Card spot, and thus once again will be playing a team that could win the Stanley Cup in the first round. But, at least you’re in the playoffs Matt! Tampa Bay starts against Columbus and, given their 3-0 record & 17-3 goal differential against them, will, in all likelihood (sorry CBJ nation) take on the winner of the rematch between Boston and Toronto. Which in all probability will lead to another rematch…So who has the upper hand? Should be we excited for said rematches? And exactly how depressed are Leafs fans? Just like last year, the Atlantic division ultimately looks like it goes though Tampa Bay. After winning the division last season and blowing a 3-2 lead in the Eastern Conference Final, the Lightning amassed a mind boggling 62-16-4 record, (tying the NHL record for wins) and their 128 points was 21 ahead of the Flames and Bruins. Their goal differential: +103. The NHL awards won’t so much be a ceremony as an au mage to this masterpiece, having already locked up the President’s Trophy, Art Ross and likely the Hart, Vezina, and Jack Adams as well. Some are suggesting, given we’re in a cap era and unmatched parody throughout the league, they may be the best regular season team ever. They’ve made a compelling case. That said, they don’t want to follow in the ignominious footsteps of the 95-96 Red Wings, who’s win record they tied, and fail to capture the franchise’s second Stanley Cup, as the rest would be seen as all for not. As for Columbus, the Blue Jackets have a plenty of high end talent throughout their lineup and will certainly be motivated to try and win the franchise’s first ever playoff series, particularly given the moves GM Jarmo Kekalinen did, and didn’t, make at the trade deadline. He went all in to bolster his roster and you have to admire his guts, even if you question the logic. He improved his team and that sends a message to both the room and the fanbase. I’m just not sure Tampa got it…The Lightning are inspired, more experienced, have a deeper roster and goalie Bob’s had his playoff issues. Columbus have a punchers chance, but realistically just aren’t the stronger team here. A Leafs team that can score once again faces off against a Bruins team with a better 200 foot game. It’s déjà vu all over again…Toronto are coming off another impressive campaign and once again find themselves facing the rival Bruins in the first round. 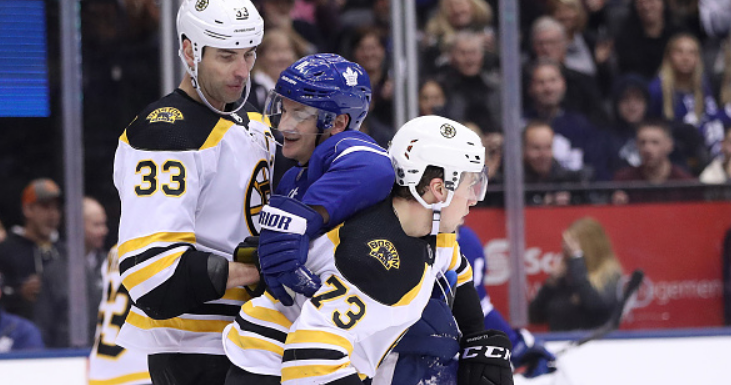 Their seven game series last season was at times dominated by the Bruins, and the Leafs are hoping the addition of John Tavares can tilt the ice in their favour. Maybe the third time’s the charm, but the reality is the Bruins have their number, and at this point are probably in their head. They’re certainly in Leaf nations. Boston won 3 of 4 matchups during the regular season, outscoring the Leafs 16-10 in the process. Neither team played their best hockey down the stretch, but the Leafs defence was particularly problematic, which is probably less shocking than actual lightning. The question isn’t so much will the Leafs give up chances as, who’ll be this year’s Jake Gardiner…? All kidding aside, there’s plenty of blame to go around as this has been an area of concerns for years (depending if you ask Mike Babcock or Kyle Dubas…) and short of Freddie Andersen bailing them out time and time again, it’ll likely be their downfall. Tampa defeated Boston in five games last year’s second round matchup, and won their season series 3-1 including a 5-4 OT thriller just weeks ago. They outscored them 15-13 so the games were by no means blowouts, but given their depth you have to like what Tampa brings. It won’t be easy as the Bruins are an experienced team and also have a deep roster. Tuukka Rask can be a difference maker in net and could help steal some games, but Tampa lost only 20 times in 82 games all season, and I have a hard time imagining anyone beating them 4 of 7 short of something drastic happening. However, that’s why they play the games.